Needing to CHILL out . . . temperature-wise? Is your outdoor thermometer’s mercury percolating up into the 90’s – 100’s (or higher)? To beat the smoldering summer heat, there’s just nothing like several scoops of freezing-cold ice cream . . . and truthfully, throughout the entire year! HOWEVER, one thing that does trump regular old ice cream is Italian GELATO! Once you’ve taken a bite into gelato (the real thing), you’ll understand what I’m talking about! And if you’re going to take the plunge into some Italian gelato, you might as well go all the way with a flavor enhanced by Italian Nutella! Do you LOVE NUTELLA, that creamy addictive stuff that some Italian guy created to get kids in Italy to eat their breakfast? What kid wouldn’t eat a Nutella stuffed pastry as traditionally served in Italy today? Sure beats cereal! The gelato is beginning to melt, since gelato does not solidify as regular ice cream does; this is the true consistency of gelato, so dig in quickly and don’t worry about perfect photography! In a medium saucepan, combine cream and 1½ cups of the milk. Set over medium/medium-low heat and bring to a simmer. While cream/milk mixture is heating, put the remaining milk, sugar, cornstarch and salt into a small-medium mixing bowl. Once milk/cream mixture comes to a simmer, add the milk/sugar mixture and stir until fully combined. Slowly whisk in the Nutella. While still set over medium/medium-low heat, continuously stir until mixture boils and thickens to where it can coat the back of a spoon (about 10 to 15 minutes). Remove pan from heat, strain and cool to room temperature. Cover and refrigerate a minimum of at least 2 hours or overnight. Whisk mixture together again before pouring into the ice cream maker. Pour the mixture into the mixing bowl of an electric ice cream machine fitted with the paddle. Turn machine on, set the timer and press start. Let mix until thickened, about 30 minutes. About 5 minutes before the mixture has finished, add the chopped pistachios through the top opening. The gelato will have a soft, creamy texture. If a firmer consistency is desired, transfer to an airtight container and place in freezer for about 2 hours. Remove from freezer about 15 minutes before serving. *NOTE: Gelato made in a regular ice cream maker won’t have the exact texture and density of Italian-made gelato in Italy made in a gelato maker, but it will still be very good. Adapted from a Cuisinart recipe. 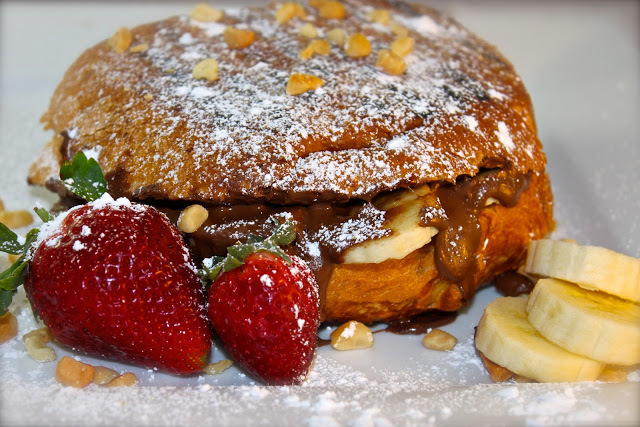 and to help beat the heat, here’s a great Nutella Panini recipe for you! ~ ~ oh so yummy! 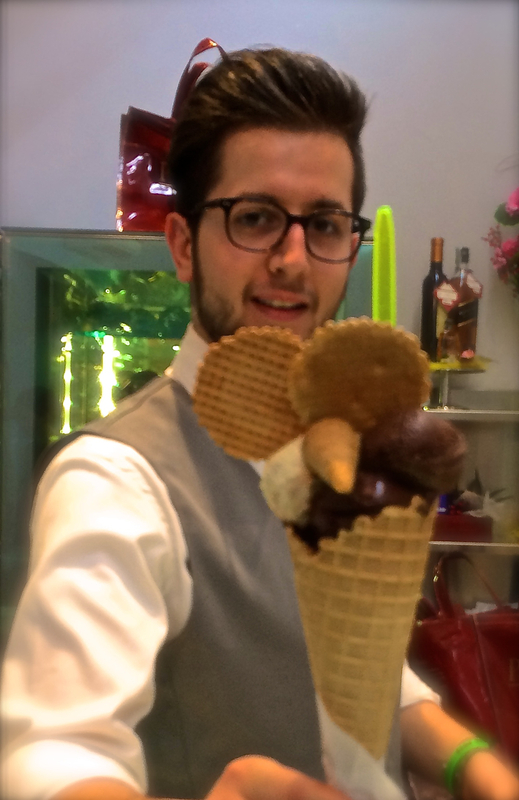 “Buon Appetito” from a gelateria in Italy! Nutella and pistachio…what more could one ask for? Those nutella mini bites are fantastic too. Thanks Angie, Nutella is such a great ingredient in recipes! Yes, Manu, wouldn’t it be nice to be able to buy some of the best that Italy has to offer? But, they’re smart in keeping the best for themselves….even the prosciutto is better there due to the top quality that they don’t export out of the country. Now I need to get my hands on some Italian Nutella! What a magnificent gelato, Roz! Thanks Liz, the photo was uploaded a bit late due to the melting factor of ice cream! This is pure wonderful indulgence and I want to be indulged. Who would not like each of these? You got that right Chaya! A perfect indulgence! Can you imagine this gelato on the panini?? I’m drooling! Oh My Word!! Pistachio is my favorite gelato flavor…now I have to have Nutella Pistachio! This looks amazing!! I never knew the Italians were keeping all the good stuff to themselves!! I will definitely have to try the Italian version!! 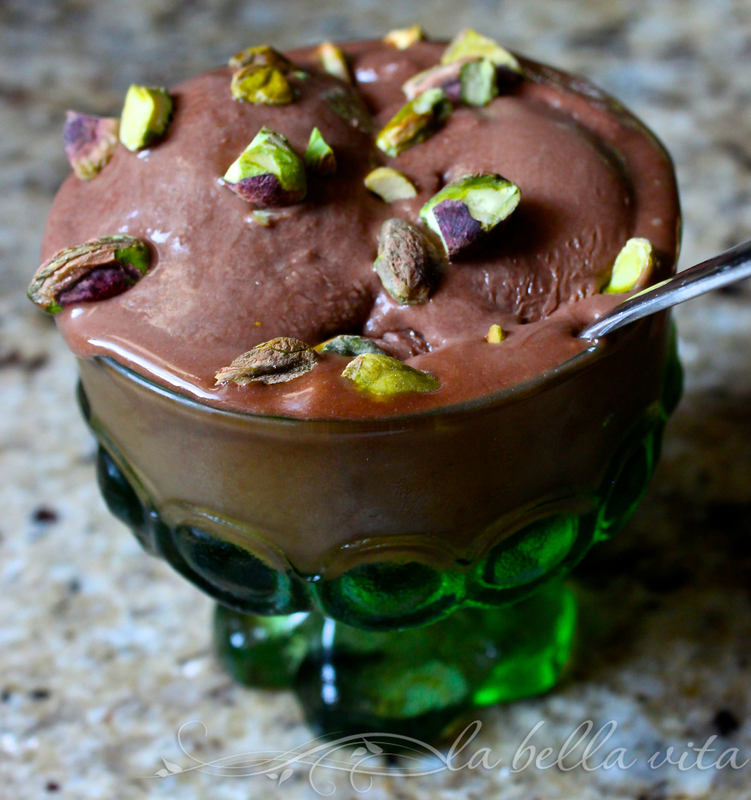 I love the combo of nutella and pistachio – yummm! Your killing me! I love this ice cream duo!! My mom brought me some Nutella from Germany several years ago and your right, there is a difference! This cracks me up because I just opened up a jar of Nutella for the family that is visiting us in Italy. They couldn’t believe how much better it is than what they get in the US. I guess I shouldn’t bring up the difference in pasta or M&Ms either. 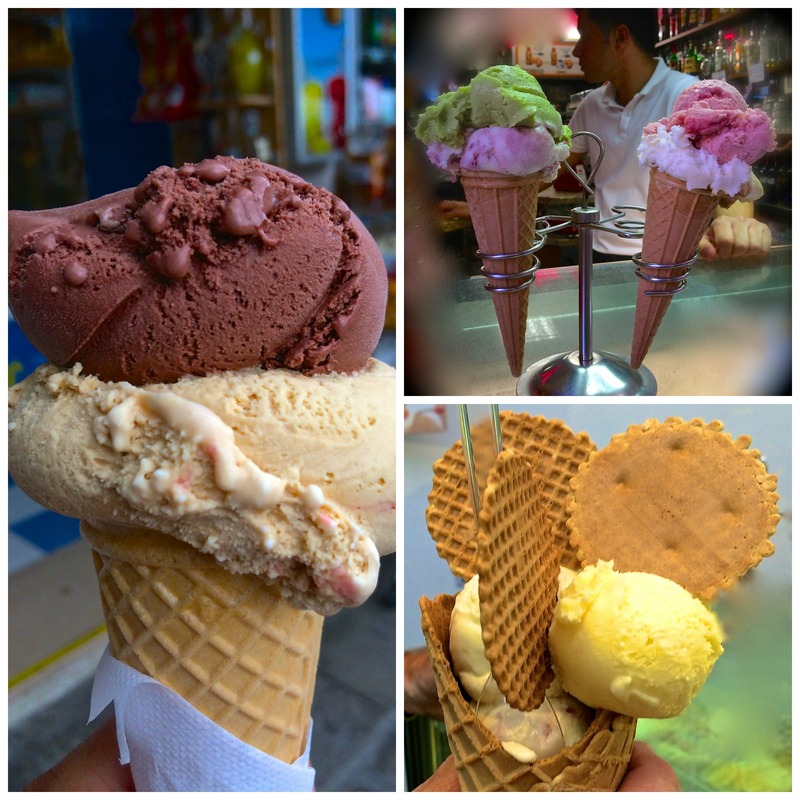 We might give this gelato recipe a try-my family has been to the gelateria two of the three days they’ve been here. Well that’s too bad we don’t get the good stuff here in the United States. This recipe sounds delicious Roz. Wish I had some right now. 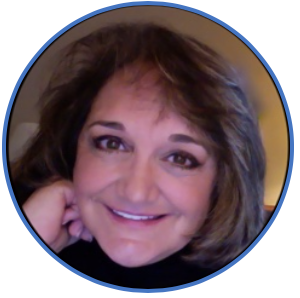 Thanks Lea Ann! Wish I could share with you somehow! Sometimes not being able to get something so special in taste anywhere is what really makes it special after all. I had pistachio gelato in Rome and it’s one of my favorite memories. Pistachio gelato is one of my FAVES!! And adding Nutella just blew me away. Love it! Pinned this early this morning and knew I would be back. I am starved for sugar and carbs and can think of no better way than to break my self-imposed fast with this recipe. Love, love, LOVE pistachio (am shouting) and Nutella – that’s a given. Brilliant combination. OMG Roz, we are truly Italian Nutella addicts! We could eat this gelato every day. 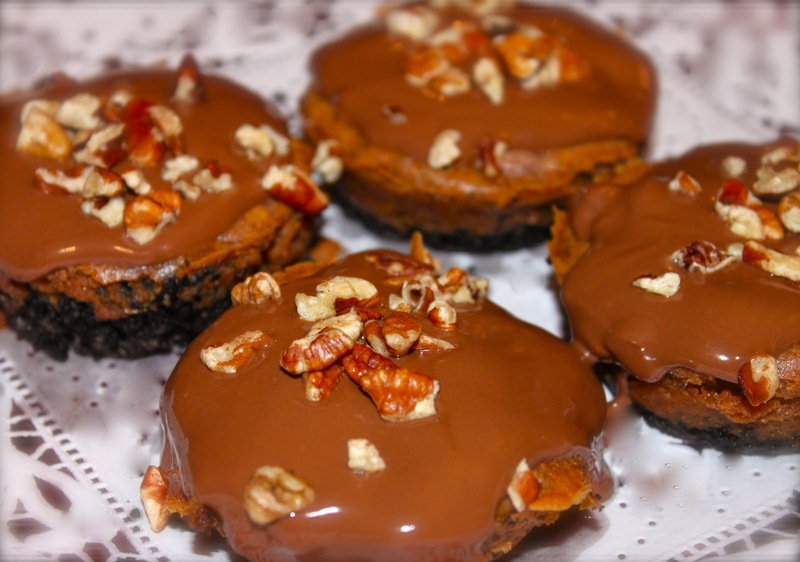 Love the other Nutella desserts you added on this post- AMAZING! Thanks Liz and Anna! I appreciate your good taste and culinary kudos! Simply gorgeous and I will have an extra large spoon to dig in with please!! What a delicious Gelato.. I can’t wait to make this! how fantastic! pistachios and nutella?? I never would have paired those together! I’m loving this combo!! Thanks for sharing! You’re welcome Alice, nutella and pistachios may not be familiar in the States, but it is a common combo in Italy. Glad you approved! I’m hiding this post from Sous Chef – otherwise he will be begging me to make this for him! Scrumptious and decadent photos! This was torture reading about your gelato recipe right now as our air conditioner is broken, and I am sitting here drenched in sweat! I wish I had some right now – Nutella and pistachios must be a perfect combination. I’m sure I would love it. I had no idea that the prosciutto and Nutella in Italy is different from the ones here. I can’t blame them for wanting to keep it for themselves! Thanks for such a refreshing, summer recipe, Roz! Holy Cow, Shari, I remember when my AC went out in Phoenix due to the overload in power usage of everyone in the Valley. So, so hot! And yup, the Nutella and everything made in Italy of first quality is kept in Italy and not exported. They’re pretty smart peeps about their good stuff . . . they don’t share! They expect you to come to Italy to buy it . . . and of course, you can’t ship most of the stuff back either due to strict customs regulations. Bought a $70 chunk of prosciutto that was confiscated at check-in. I learned an expensive lesson! Ooh that combination of nutella and pistachio looks divine!